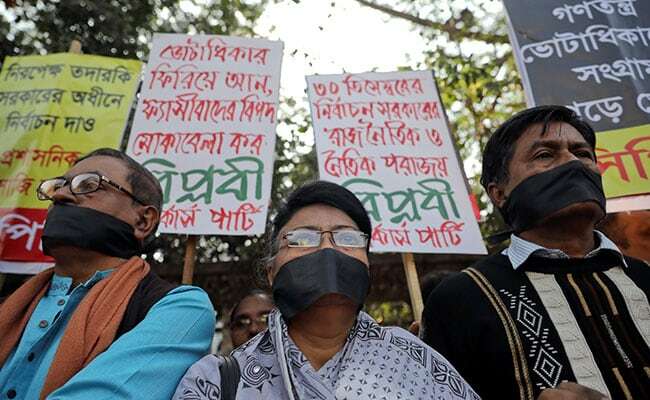 Opposition members of Bangladesh's parliament boycotted a swearing-in ceremony on Thursday, after rejecting results of a general election that they said was rigged to give Prime Minister Sheikh Hasina her third straight term. Ms Hasina's ruling alliance won more than 90 percent of the seats contested in Sunday's election, which was marred by accusations of ballot stuffing, voter intimidation and violence that killed at least 17 people. Ms Hasina and her ruling Awami League party have dismissed the accusations. While all 291 newly elected members of parliament, including Ms Hasina, from the ruling bloc were sworn in, the seven opposition members stayed away. They must take their oath within three months or forfeit their seats. Leaders of the main opposition Bangladesh Nationalist Party (BNP) could not immediately be reached for comment. The BNP sent a letter to the government on Wednesday seeking permission to meet their leader, former Prime Minister Khaleda Zia, who has been in jail since February on what they call trumped up charges. On Thursday, New York-based Human Rights Watch said the run-up to the vote was characterised by "violence and intimidation against the opposition ... and the misuse of laws to limit free speech". "Reports of ballot stuffing, intimidation of voters, and ruling party control of voting locations on election day mean that an independent and impartial commission should be formed to determine the extent of the violations," Brad Adams, Asia director at the rights group, said in a statement. Western government, including the United State and the European Union, have condemned the election-day violence and called for investigation of a range of irregularities. 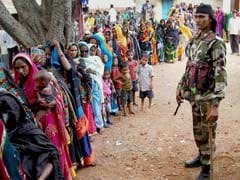 Ms Hasina said after the results came out that the vote was largely peaceful and voters had taken part enthusiastically. The BNP has said its workers were being attacked across the country by Awami League activists. The ruling party has denied the charges. Ms Hasina, whose father, state founder Mujibur Rahman, was assassinated in a coup in 1975, has alternated in and out of power for nearly three decades with her main rival, BNP leader Khaleda. Ms Khaleda was First Lady when her husband, Ziaur Rahman, was president from 1977 until he was assassinated in 1981.